Tobias A. 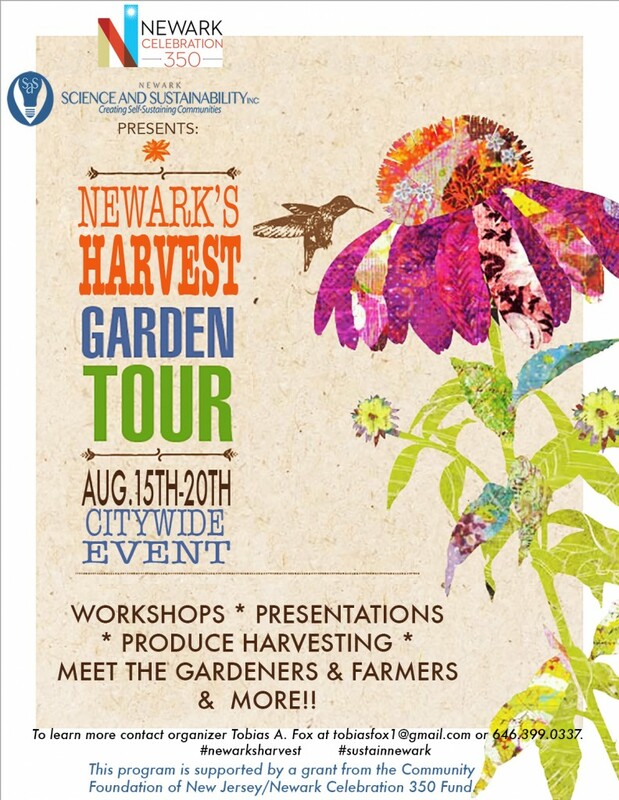 Fox, Founder of Newark Science and Sustainability, Inc. (Newark SAS), in collaboration with over a dozen gardens and urban farms across Newark, New Jersey, will present Newark’s Harvest as part of the City’s 350-year celebration during the week of August 15-20, 2016. This week long, historical garden tour and present day harvest will provide an opportunity for residents and visitors to become informed about the various agricultural spaces that exist. This event will serve as a means to encourage healthy eating, healthy living practices, and environmental education. Through a series of workshops, presentations, and by reaping the benefits from the harvests of each of the participating spaces, residents will walk away with healthy, locally grown produce and a broader awareness of environmental stewardship. This program is supported by a grant from the Community Foundation of New Jersey/Newark Celebration 350 Fund. EVENT: We will be operating a Pedal Bike Powered Smoothie Bar to engage participants in the use of renewable energy, wellness and nutrition education. EVENT: Plant it forward! Also, creating healthy soil from compost + vermicomposting (workshop starts at 12pm). Newark high school students will give farm tours and visitors can help harvest local, seasonal produce on an urban farm. EVENT: Tour of greenhouse. Also, participate in a Farm to Table workshop, where people learn how to prepare healthy meals. EVENT: GMO OMG: Looking at our food and how it affects our health. EVENT: Building of a Sweat Lodge and Sweat Lodge Ceremony followed by an Eco Art Workshop with visual artist Roxana Marroquin. EVENT: Sustainable Living through science. Looking at how science has and will continue to enhance every aspect of our social life. EVENT: Youth, Master Gardeners, and Rutgers VETS team up to grow the Branch Brook Park Children’s Garden. EVENT: Bringing closure to the week-long citywide garden tour. Inviting all gardeners/farmers for a silent meditation and lunch.